I was waiting forever for this location to open! I've heard so much about Matchbox's wood-fired pizza in Chinatown, so when their new Rockville location opened I went with a group of friends to try it. Located in Wintergreen Congressional Plaza, there is plenty of parking. The closest metro stop is Twinbrook on the red line. The space is so HUGE! There is a full ground level, part of a second floor and then one larger table above everyone else, which is where we sat. I love the front wall. It reminds me of some alien-invaded barn (strange, I know), but it looks super cool. Even though it looks nice, I think there is a lot of wasted space. When the weather is nice, there are 2 outdoor patios and fire pits. I ordered a cocktail, Pamatea (firefly sweet tea vodka, pama pomegranate liquor, lemon zest) for $8, which I actually hated. It was so strong I couldn't enjoy it and ended up giving it to a friend. 2 of my friends ordered Cream of Crab Soup (jumbo lump crab, sherry, gruyere) for $6. We all tried it and it was delicious! It is very rich though, so perhaps a cup rather than a bowl would be better if you were ordering pizza too. -Sweet sopresatta & wild mushroom (fresh herbs, zesty tomato sauce, mozzarella) for $19. I enjoyed the Prosciutto white the best! It was the only small we got and it was 1 of 2 that didn't have tomato sauce. A table favorite was the Fire & Smoke because it was spicy. How cute! My cousin and I's birthday is 6 days apart, so we both received a Chocolate Chip Bread Pudding (banana, rum caramel, fresh whipped cream) for $8 with candles on them. I'm very critical of bread puddings, so I thought it was good but still didn't compare to Gordon Biersch. The service was great because the server was very competent and food came out quickly. The pizza was good, but I wouldn't say it was better than any other wood-fired pizza I've had before. They're also a bit pricey at close to $20 for a large, thin pizza. They also offer a unique seating arrangement in front of the wood-fire oven where you can watch the pizzas being made. Apparently I'm celebrating my birthday all January! 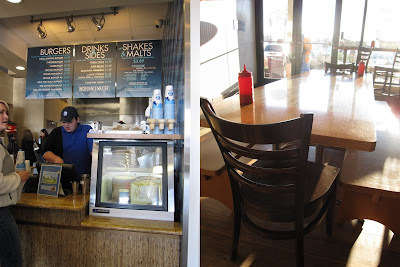 My cousin bought a Living Social deal for Elevation Burger in Arlington, VA and we met up for lunch on a lazy Sunday. One of the recent fads in the area has been new burger places and this place brings something different to the table with healthier ingredients and sustainable practices. Located in a shopping center, there is parking but it gets crowded as its shared with a super market. The closest metro station is East Falls Church on the orange line. Small interior made with sustainable items like bamboo floors, compressed sorghum tables, LED lights, recycled materials, etc. There aren't many tables, so thankfully we were able to grab one as a family was leaving. What sets this burger place apart is the 100% USDA-certified organic, grass-fed, free-range, ground-on-premises beef. We both ordered the cheeseburger ($3.99 each). Reminded me of an In-N-Out burger because of the paper wrapping. It tastes good, the patty is thin, and isn't overly heavy or large. I ordered mine with Elevation sauce, which reminded me of McDonald's special sauce. We ordered their freshly-cut fries ($2.59) that are fried in 100% olive oil. They're thin like McDonald's fries and have a slightly different flavor because of the olive oil but I liked them a lot. My cousin prefers them cut thicker, so I ate most of them. We both ordered milkshakes ($3.89 each), Oreo cookie in chocolate (top) and strawberry in vanilla (bottom). I ordered black cherry in vanilla but ended up with strawberry. It was good, but tasted exactly like a McDonald's one, so I don't think it was worth the price. Lastly to use up the rest of the deal, we got a chocolate chip oatmeal pecan cookie ($1.49). It was very dense and thick. The flavor was nice, but I wasn't a huge fan of the texture. I enjoy supporting places that practice sustainability and offer healthier options. Besides organic beef and fries cooked in olive oil, there are veggie burgers ($3.59) and salad ($3.99). The cashier was very knowledgeable and food came out pretty fast. Prices are fair, so I'd recommend trying it if you want a lighter burger option. Sorry I've been MIA guys! These past 2 weeks with me being sick and now the bf has been tiring. However, we did have time to celebrate my birthday! Capricorns baby! Last year consisted of drinking and dancing with 30 of my friends at Lotus Lounge. This year I was super anti-celebratory. I just wanted to have a chill dinner with the bf and save $ at the same time by using a Groupon. 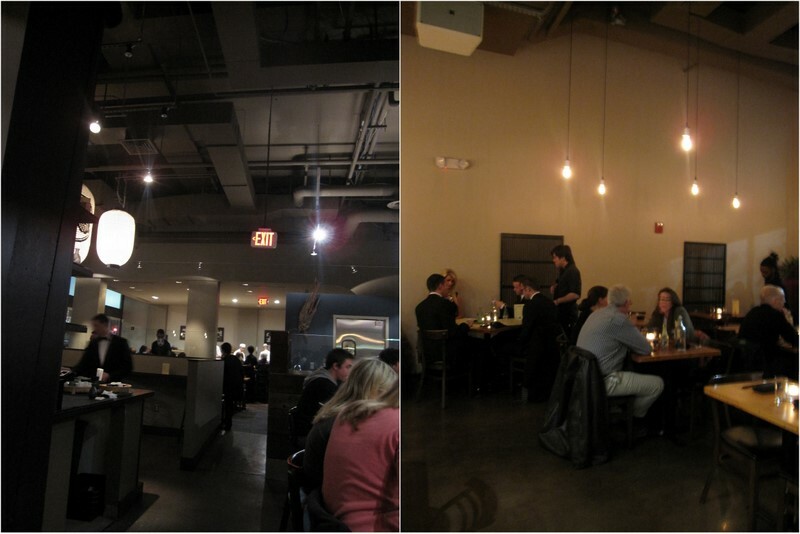 We ended up going to Kushi, a Izakaya (Japanese gastropub) in Mt. Vernon Square. There is metered street parking and the closest metro stop is Mt Vernon Sq - 7th St/Convention Center on the green/yellow line. The interior is split up into 4 sections: main dining room, robata grill, bar and sushi bar. Very simple decor, nothing really fancy on the walls. Large blocks of wood, smooth concrete and hanging light bulbs. This izakaya is something unique to DC when it comes to Japanese food. The focal point of the restaurant is the open robata grill, which is where you can watch the chefs in action! Small plates and kushiyaki (grilled skewered items) are the specialties. The bf and I were able to sit at the robata grill, which I would recommend because it's fun watch and talk about during dinner. The menu is quite overwhelming. There are many sushi, small plate and kushiyaki options. It took the bf and I a while to decide which ones seemed worthwhile to try. Like other tapas-style places, the small plates are meant to be shared. This little shrimp "shu mai" item arrived at our table, and we were like "did we order this?" We were then told it was a complementary item to start off everyone's meal. Very yummy too! I love braised pork belly ($4.50) because of the tenderness and fat. This one came with a nice broth and mustard to add some acidity. I enjoyed it, but the bf thought it was too fatty. We wanted to try something that sounded different and ordered the egg custard with seafood and mushrooms ($7). It was very silky and had the right amount of salt. From top to bottom: duck breast and scallion ($4), crispy chicken skin ($4), lobster tail ($18). The bf liked the duck more than I did because I thought it was a bit tough. The chicken skin was good but doesn't beat Popeyes fried chicken skin. The lobster tail was delicious too but not worth the price. The bf chose the chicken breast w/ plum ($5), which I found a bit dry, so I let him have 2 of the 3. We enjoyed the grilled squid legs ($4) a lot actually. Cooked perfectly, not overcooked or chewy. Nice simple grilled flavor. Very impressed with the yellowtail & scallion roll ($7) because of the great quality of ingredients. It almost melts in your mouth. Also, I don't recall seeing yellowtail chopped before, so that was nice choice that contributed to the smooth texture. We also ordered flying fish roe ($3.50) and eel ($5). The fish roe was oily, but didn't leave a greasy film in my mouth. I liked that they were cold, so it was a nice sensation paired with the warm rice underneath it. The eel was fresh and a cut large. The texture was soft and not scaly. We topped off dinner with some unique ice cream flavors. Black sesame and wasabi topped with crystallized ginger ($3.75 each). The black sesame was more enjoyable because it reminded me of chocolate making it easier to eat more. The wasabi was veryyyy different! The 1st bite will awaken your taste buds. I enjoyed the fiery sensation at first, but as I kept eating it, it intensified and the flavor changed to the point I didn't want to eat it anymore. The food came out quickly and it's relaxing to watch the chefs at the robata grill because they're very calm while they cook. The staff was nice and easy-going, and that was exactly how I wanted to spend my birthday. I wanted an interesting, but laid-back night eating high quality food. I was full, but like many other restaurants serving small plates, its not enough food for the bf at that price. I would say a few items we had were memorable (yellowtail & scallion roll, grilled squid legs and wasabi ice cream) while the others were good, they didn't leave a lasting impression. Some items I was hoping to try that night like sea urchin and extra fatty tuna were unavailable. This is a very simple recipe using many common baking ingredients you'd probably already have in your house, except for the fish sauce. Fish sauce is liquid derived from fermented fish. Appetizing, huh? I know it sounds gross if you've never had it before but it's a staple ingredient in many Asian foods, so you get used to it after a while. It has a very pungent smell and salty taste. You can use any kind of fish sauce you like. I bought Squid brand because that was the brand always in my house while growing up. 2. Stir together flour and baking soda. 3. Beat butter, granulated sugar, brown sugar and vanilla in large bowl with mixer until creamy. 4. Add eggs and nuoc mam; beat well. This part gets stinky... you're gonna be like "why did I just add fish sauce to my cookies?!" but I promise it won't smell during or after baking. 5. Gradually add flour mixture, beating well. Stir in chocolate chips and nuts, if desired. Drop by rounded teaspoons onto cookie sheet lined with parchment paper. 6. Bake 8 to 10 minutes or until lightly browned. Cool slightly; remove from cookie sheet to wire rack. Cool completely. I baked different batches for different times, and found the cookies with a shorter baking time were still soft the next day. They taste really good! Honestly, they don't taste any different from regular chocolate chip cookies. The BEST part of this is watching your friends and family's reaction when you tell them what they're eating. It's PRICELESS. I do plan on making these again with a higher amount of nuoc mam in it, just to test the flavor. Over 200 restaurants are participating! Too many too list, so check out the listing and make your reservations by clicking on the OpenTable.com links provided. Finally a VA post! Getting Korean BBQ at 24-hour Honey Pig has been on my list for a while, but I actually had an opportunity to go this time! Relatives from Vietnam were in town, so our family figured it would be a fun place take them. Located in Annandale among so many other Korean restaurants, it is a bit hard to see from the road, but there is free parking in front and around the building. The closest metro is East Falls Church on the orange line. They make it easy to order with huge posters of their menu items on the walls. Very industrial feel with metal and pipes decorating the interior. It doesn't feel stale, but more like an "underground" club. Along with the posters are TVs, and Korean pop music BLASTING throughout the restaurant. It makes you feel young, happy and like a popular Korean high school kid out with their friends. The place was packed on a Saturday night for dinner. Thankfully, we made reservations for our group of 7. Looking at their menu, this was the 1st time I had seen food "on sale", but my cousin who has been numerous times said it's always "on sale". This is actually the cheapest Korean BBQ I've ever seen. Compared to some places, it's like 50% cheaper. They do encourage 2 orders per meat, but at these prices it's no big deal. Surprisingly this was the only ban chan (complementary side dishes) we received. I'm usually used to a larger variety, but that's fine considering the BBQ prices. Some of the items included salad, kim chi and acorn jelly. While waiting for the rest of our group to arrive, we started off with 'Mando (dumplings)' for $7.99. I believe they were pork-filled, and fried to perfection. I would definitely order these again. We also ordered a 'Seafood Pancake' (sorry forgot the price), and it was SO good. It was the right amount of crispiness and flatness that I like. I was impressed. Onto the BBQ! Remember that all pics shown are 2 orders of each meat. We ordered 3 different kinds, and this time the table-top grill wasn't "in" the table, but on top. The 'Bulgogi (sliced marinated beef)' for $12.99 looked and smelled great as it was cooking, however the taste wasn't spectacular. It was a bit bland, and not as tender. Is this beautiful or what? They had 2 types of 'Galbi (marinated beef short ribs)' but we ordered the cheaper one for $16.99 called 'L.A. Beef'. I don't know what the difference is between the two, but this was fine and my favorite cut of Korean BBQ. My favorite galbi is still at Woomi Garden, but this was 1/2 the price for much more food. We also ordered some 'Spicy Pork' for $12.99. It looks spicier than it really was, so I actually could enjoy it! There is kim chi mixed in with the pork to give additional flavor. It actually wasn't what I expected when we ordered it, but it was ok. Happy and full relatives! It was a lot of fun having visitors in town. For dessert we went down the street to Shilla Bakery and got 2 'bingsoos (shaved ice)'. They had red beans, green tea ice cream, fruit, mochi and condensed milk drizzled on top. So good, but so filling and cold. I had gone to the one in Rockville, and I did enjoy this location better. My favorite part of the meal was the environment. I loved the music, the food-loving crowd, and pop star posters. The dumplings and pancake were really good, but I found the BBQ to be closer to average in taste. I'd still go back because of the affordable price. The servers aren't the friendliest people, but they attend to your food and table. It's a great place to go with friends and I'm sure it's even more insane when the late-night bar scene gets hungry at 3am.